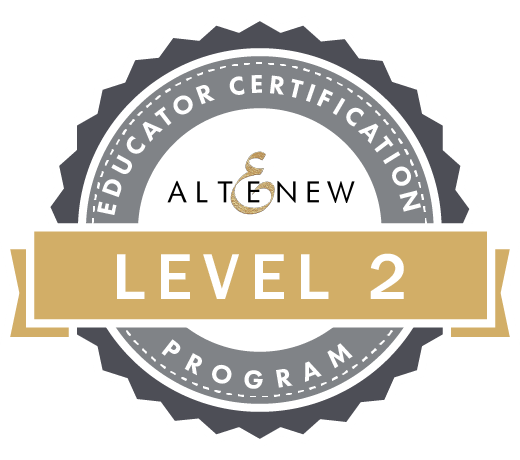 Welcome to Altenew Educators Blog Hop! As Altenew-Certified Educators, we were asked to share our FAVORITE (techniques, styles, Altenew supplies…)! My name is Patty and today I am taking part in the Altenew Educator Blog Hop. This is my first blog hop ever, so I am very excited! Thank you for stopping by. I was part of the first group of AECP participants accepted in fall 2017. I really enjoyed being a part of the AECP, it gave me the accountability to practice the techniques that I learned in the videos, and the discipline to finish my cards and complete each Level. Virginia Lu was always so encouraging … and I really needed it…. because I would either over think or under question, which left me two – timing my “Challenges” (yes, doing them twice, except the last one…I learned). 🙂 It was a great experience, and my advice to any of you in the process is to take your time and enjoy it. Don’t worry about what any one else is doing or how fast they are going, enjoy YOUR journey and discover some techniques that you really like and a style that expresses who you are. That’s what makes the process so rewarding. When I started the program I was so intimidated by the technology side of it, wanting my pictures to look nice, then uploading them….what’s Flickr?! Start a blog, hmmm, I’m not sure I’m ready for that…every thing seemed like it was going to be so hard and daunting to get right, but when you take things one step at a time and ask some questions, it really is pretty easy. I found Virginia was such a HUGE help (and still is), and now we have the wonderful Face Book page we can ask each other questions and help each other along. It’s great! Take advantage of it. I actually started my blog without asking my 2 very capable daughters to hold my hand all the way through it. 🙂 That’s a miracle itself. The card I am sharing with you today uses the Dandelion Wishes Stamp and Die Set and it has had seven versions as I prepared for the blog hop. That may sound like a little much 🙂 (because it is) but I wanted to play with the stamp set and see what I could do to make it look like the dandelion wisps were light, fluffy and flying through the air. I hope to have captured it in my card today. At this point you might think that “my favorite” thing is to do something over and over again, but it’s not. 🙂 My favorite stamps are Dandelion Wishes and Freeform Greenery because I get excited to make something that has movement, as though the wind just blew. My favorite sentiment didn’t make it on my card today, but it did on one of the six trials…it is “just breathe” from the Moroccan Mosaic Stamp Set. Here’s my card. I hope you like it. The dandelion heads are made of heat embossed vellum with a plain white die cut of the dandelion head underneath it. How I made it: I started my background with a 5.5″ x 5.5″ piece of Neenah Solar White Classic Crest card stock, dry embossed with the Altenew Warp Speed stencil. I cut this piece down to 5.25″ x 4″ and rubbed the four sides of the card stock with embossing ink and heat embossed with Altenew Translucent Pearl Embossing Powder. I stamped 2 full-head dandelions and 3 half-head dandelions with Altenew Evening Gray ink on Vellum and heat embossed them with Altenew Crystal Clear Embossing Powder. I stamped the seeds in Lava Rock ink and heat embossed with Altenew Crystal Clear Embossing Powder. I also stamped, on Vellum, a number of the dandelion wisps (with Evening Gray ink) and heat set them with Altenew Crystal Clear Embossing Powder. I stamped 5 stems using Altenew Frayed Leaf, Forest Glades and Evergreen inks. I die cut the vellum dandelions and wisps, along with 2 full-head and 3 half-head dandelions, and the stems, out of #80 Neenah Solar White card stock. This image reveals the shine that the Crystal Clear and Translucent Pearl Embossing Powders give to the Dandelions. To prepare the dandelions I sprayed a bit of spray adhesive into an empty cardboard box and dipped the centers of the dandelion heads into the spray adhesive (it was a little wet) then attached them to the plain white die cuts of the same size. I did this for all five dandelion heads. To assemble the card I used an adhesive roller to tack the stems to the dandelion heads. I then arranged the dandelions until I liked how they looked on the embossed background. I used small foam squares to glue the dandelions in place and trimmed the stems. I then sprayed some spray adhesive into a box, dipped the Dandelion wisps into the spray adhesive (it is wet) then adhered the Vellum dandelion wisps around the card as though they were being blown off of the dandelion heads. Heat embossing on vellum makes these Dandelions appear soft and light. To make the sentiment I used deep green card stock and heat embossed with Altenew Pure White Embossing Powder. I adhered the sentiment with foam tape. I adhered the card front to the card base with a layer of craft foam in between. Make a wish and believe it will come true! Supplies: The supplies I used were Neenah Solar White, Classic Crest #80, #110 card stock, Vellum, Altenew Crisp Dye inks: Frayed Leaf, Forest Glades, Evergreen, Evening Gray, Lava Rock; Versamark ink, Altenew Crystal Clear Embossing Powder, Altenew Translucent Pearl Embossing Powder, Altenew Pure White Embossing Powder, Craft foam, E600 Spray Adhesive, foam adhesive and flat sequins. Altenew is giving away $30 Gift Certificates to THREE lucky winners! Please leave a comment on the Altenew Card Blog by Jan. 23rd for a chance to win. Three winners will be announced on the Altenew blogs on 1/25/2019. To leave a comment on my post please go back to the top of my page and see the left hand column for Comments. A great job! Congratulations on your achievement! Really like the monochromatic coloring with the pop of green. Stunning result. What a beautiful card. Thank you so much for sharing! I love your subtle use of color and the delicate composition makes me yearn for dandelion time to blow and make wishes come true! Love the dimension and soft colors! Beautiful card! I LOVE this card! Everything about it strikes a chord with me. Keep up the great work. Oh Patty, you absolutely accomplished what you set out to do with your dandelion stamps! Lots of movement with the stencil, embossed vellum, dimension, and sparkle along the edges! This is a really beautiful card. Thanks for sharing! Gorgeous card! Thank you for sharing! Patty, your card is my absolute favourite of all I’ve seen so far on this blog hop. It is almost ethereal looking & so soft & the way you stamped them on white & then again on vellum & heat embossed the dandelion heads make them so beautiful. Like you could “just breathe” on them & they’d float away. When I was reading about you being concerned you weren’t keeping up with others, etc., I thought, that’s exactly how I’d be. My confidence is not way up there when it comes to crafting although I do enjoy cardmaking. Thanks so much. Hi Teri, Thank you so MUCH for your personal note to me. I so appreciate all your encouragement!…and I bet your cards are beautiful!! Really like you card Thank you for your work. I would not be able to make cards without people like you that share your samples. Very beautiful and soft. Great advice too! Amazing card. You get the impression they could blow away at any moment…well done. Thank you for sharing your talent. Beautiful monochromatic card, love the softness you achieved. WOW Patty, this is one stunning card! You achieved the movement perfectly and the shine is beautiful. Very well done! Beutiful!!! You did manage to capture the wind blowing the tufts through the air? Thank you for your step-by-step process. Now I can see if I can create one that is similar. 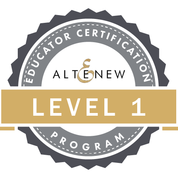 Also wanted to congratulate you on the hard wrk of becoming an Altenew-Certificated Educator. Wow, I love how you used this stamp. It certainly does look light and airy. Nice job. Beautiful card and great application of embossing techniques! Beautiful card – the dandelions look “fluffy”- very cool! Beautiful card. The dandelions look so real! Those dandelions are so real, I wanted to blow on them! Love all the layers and the way you created the base card, too. Can’t wait to try out your techniques on my own! Thanks for the detailed instructions and papers. And for sharing with us here! Heartiest Congratulations for this achievement, Your card is a stunner!! Love your card. The colors are so soft and pretty! I am ready to make a wish! Congratulations on completing the educator program. Beautiful card. I love those gorgeous dandelions. Congratulations on becoming an AN Educator Patty! Lovely card design, love all the texture you have added. Thanks for the inspiration and for the giveaway! I usually don’t care for monochromatic cards, but your card is mesmerizing to me! It is beautiful! The shimmer of the pearlized powder makes the card! Nice job! I love the hint of green color! Again, it is hard to get my attention, but you certainly did! Congratulations on becoming an Altenew Educator.Thanks for the inspiration and for the opportunity to win! I can’t wait to make a wish. Beautiful card! Thanks for sharing! Congrats on being an Altenew educator! Beautiful card I love the combination of cardstock and vellum for the dandelions! Love your card and the dominion you gave the dandelions. I am looking forward to spring and having a yard full of them, even if my allergies go haywire. Congratulations Patty, your card is so gorgeous and unique. I feel it warm and cozy . It really touch my heart. Its truely having this unique design and technique. I loved your story about the program. And Who does it helped you to create your blog . So happy for you and am excited to see more of your amazing creations . I wish you more success. Enjoy your coming journey. Hi Patty! I’m so happy to know that you are also a newbie at blog posts, uploading to sites,linking your work, getting the right lighting for photos etc (I’m not alone!!! )… the list goes on but after everything is done, you feel this sense of accomplishment, right? Just gorgeous! I absolutely love the colors and how delicate this card is. You’ve inspired me, such beautiful work!